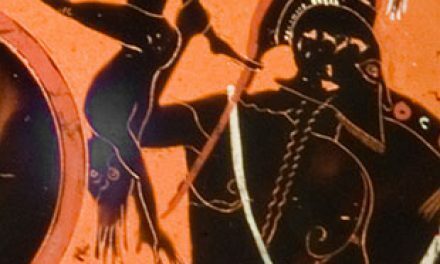 Sometimes Greek sculpture startles with its beauty and poignancy. 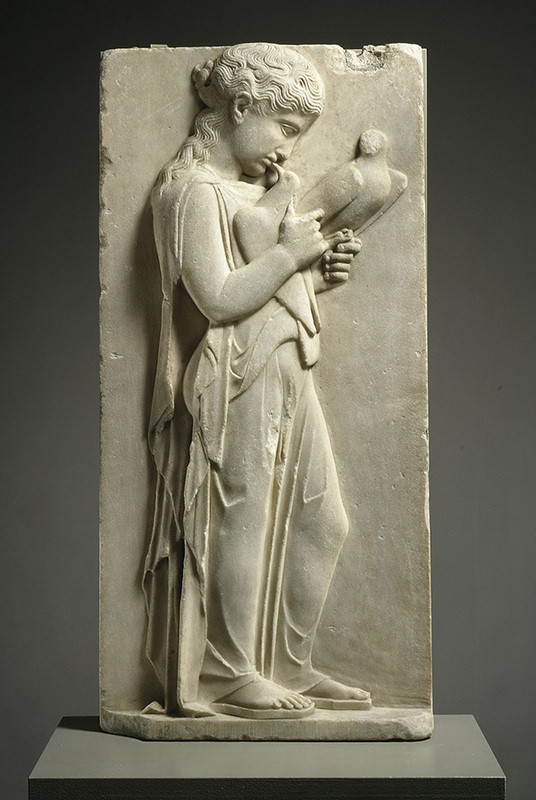 This marble relief with a young girl holding a pair of doves, dating from about 450 B.C., is such a work. 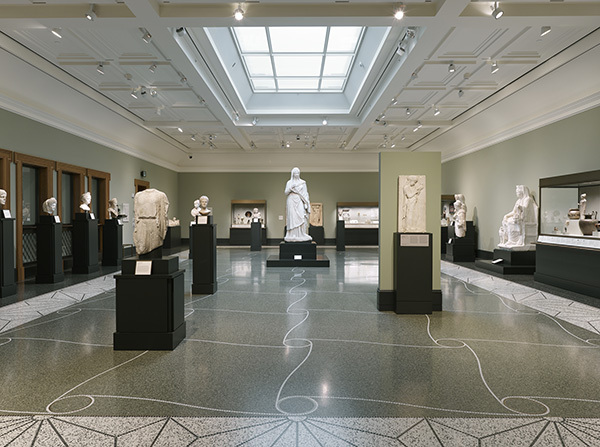 Currently on loan to the Getty Villa from the Metropolitan Museum of Art in New York, the sculpture immediately impresses us with its charm and grace. The girl is very young, perhaps only five or six years old judging from her small stature, large head, and plump arms. Her woolen garment, worn without a belt, reveals her rounded body through the finely carved drapery that seems a bit too long, as if it would drag behind her if she stepped forward. She has luxuriant, wavy hair tied in a bun, with long tresses falling down her back. Her face is broad, with well-defined eyes and mouth lacking expression—typical stylizations of the fifth century B.C. In contrast, the pose of her body communicates emotion. Is it sadness? She stands at rest, gently holding her pet doves, one by the feet and the other clutched to her chest. Perhaps she is speaking to them softly, or even kissing them. The emotive quality of this image increases when we realize that this is the girl’s gravestone. She died as a child, and her family chose to remember her in a moment of tenderness and innocence. Is she saying goodbye to her pets, just as we bid her farewell? This masterpiece of Classical sculpture was found in 1785 on the Greek island of Paros, the source of the fine marble highly praised in antiquity for its pure white color and translucence. 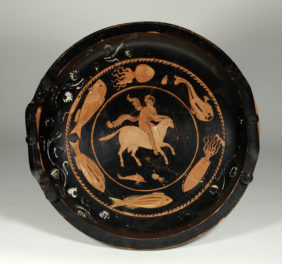 Little is known about the sculptors from the island, but this and several other works dating to the fifth century B.C. show the great skill of the local artists. 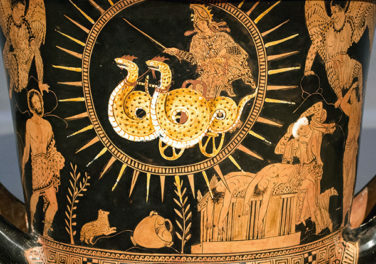 After its discovery, the relief was brought to England for the collection of the earls of Yarborough, where it remained until it was acquired for the Metropolitan Museum in 1927. Marble Relief with a Young Girl Holding Doves (at right), a loan from the Metropolitan Museum of Art, installed in the Getty Villa’s second-floor galleries. What is difficult to discern from the drawing, and is not noted in the description, is that Lady Louisa does not just hold her hands to her heart, she holds a dove to her breast. Its outspread wings and limp neck, head falling to the viewer’s right, suggest that in this case it is the bird whose soul has taken flight, not the child.